BEEPATRICE: "No, you need to look it up on YouTube! It all makes sense! The Collective Intelligence is manipulating us all to fulfil the Prophecy of the Yellling Bird!" ROKO: "Do you want that report in 10- or 12-point?" Do I do the obvious? 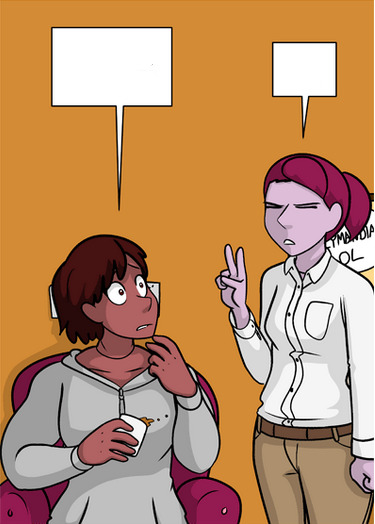 BEEPATRICE: "But there's this whole MESSAGE BOARD that continually argues about things like Hannelore returning and some guy named Angus..."
ROKO: "You're one of those 'fourth wallers', aren't you?" BEEPATRICE: "I have no nose!" ROKO: "How do you smell?" ELLIOTT: "Live long and prosper!" Both speaking in Danish Finnish. ELLIOTT: "elää pitkään ja menesty!" I was too tired to think of anything clever and for some reason Danish came to mind. Well, what else would you expect in a bakery? BUBBLES: "I understand acting for principle but don't you think haranguing people who waste bread goes too far?" ROKO: "I will know victory!" BUBBLES [shocked]: "You did what?" "Elä pitkään ja menesty" would be a good translation of "Live long and prosper". The form "elää" sounds wrong here. That would be either an infinitive or third person singular form, so "To live long and prosper" or "Lives long and prosper". The meaning would be clear but both of those would also sound slightly off, right? The fairy from Peter Pan had her name translated to Helinä-Keiju in Finnish. Check the English equivalent of that WP-page for a proof. The names of characters of stories are impossible to get right. The people translating use creative license when thinking of somewhat equivalent names (some of them do an admirable job). Sorry, I couldn't figure out what this was supposed to be a google translation of In Finnish the meaning/use of the English words "sound" and "voice" merge to Finnish "ääni", somewhat depending on the context. Opposite phenomena also exist. One of the things that make machine translation very challenging. Bubbles: "You mean other people have actually sat in my chair, and I didn't notice?" Roko: "Two, at the very least." "windchime" ="tuulikello". Again, Wikipedia is wonderful. Go to the English language page, check out "languages" in the left column, and click "suomi" for Finnish. Here Finnish is possibly a bit richer in the sense that I would use "helinä" as a word for a sound a (tinker) bell, a wind chime makes, possible some other bells. Proving the earlier point that "Helinä-keiju" is a very good translation for Tinker Bell ("keiju"="fairy"). Edit: Actually, I wasn't entirely fair to the English language above. "Helinä" is roughly the same as "Jingle". I don't know if English speakers would say that "a windchime jingles"? Ok. So quality translations are very difficult to produce in an automated way. Roko: No, number 2. Spookybot just arrived.